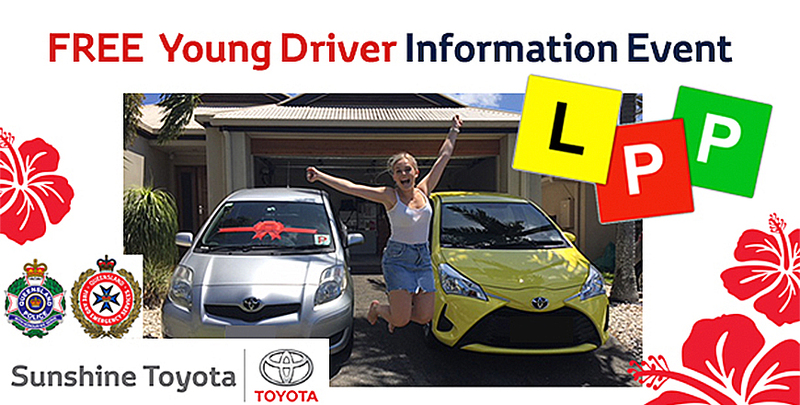 Sunshine Toyota has now hosted three successful Young Drive Information Night Events! A video of our March 2018 Event! We are welcoming Sunshine Coast L & P Plate drivers as well as their parents to attend the next event. There are only limited spaces available for the nights so we suggest contacting our Marketing Coordinator Danielle Little by clicking here > daniellel@sunshinetoyota.com.au to register your spot at our next event as soon as you can! Sunshine Toyota cares about the road safety for all our guests, the Sunshine Coast community and for all future drivers. We understand the great importance of young, learning drivers having the fundamental knowledge of what to do in the case of an emergency on the roads, as well as have some basic knowledge about their car and how to keep it running safely. This is why we are hosting a FREE interactive information night for L & P-Plate drivers! Location: Sunshine Toyota, 689 Nicklin Way, Currimundi. What else will be included in the event? We will provide all attendees with snacks and refreshments to keep you going through the event. We will also provide gift bags as well as give out prizes for pop quiz questions (so make sure you pay attention). Attendees will also receive a voucher for driving lessons with Right Turn Driving School as well as a voucher for a Used Vehicle from Sunshine Toyota! Please be aware photos will be taken on the night and shared on our Social Media pages. By attending the night you are giving permission for you and all attendees to be photographed.